Design to simplify service is a primary goal with every AaLadin Pressure Washer. The manifold plumbing system is a great example of this effort. 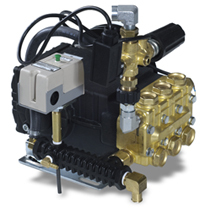 Other pressure washers are plumbed with all components connected to the pump through a series of fittings. The result is every time the pump or attached components require service, the process of disassembly and assembly is lengthy and costly. AaLadin utilizes a manifold plumbing system with quick connections on the low pressure side of the pump becoming a central attachment point for the pump, unloader, and related items. The result is a design that allows the components to be removed for service in a matter of minutes no matter how serious the repair. Competitor brands rely on a series of fittings requiring additional time for teardown and reassembly. This results in less time for teardown and reassembly which lowers the cost of the repair.